A previous study has shown that low vitamin D levels improved with anti-TNF therapy for Crohn’s disease in the absence of supplemental vitamin D. Similarly, a recent study (MA Atkinson, MB Leonare, R Herskovitz, RN Baldassano, MR Denburg. JPGN 2018; 66: 90-4) showed improvement in iron metabolism with anti-TNF therapy. In 40 children and adolescents with Crohn’s disease, the authors measured serum hepcidin-25 and hemoglobin at baseline and then 10 weeks after anti-TNF therapy. Median hepcidin concentrations decreased (27.9–>23.2 ng/mL) and mean hemoglobin increased (10.6–>10.9). Disease activity and markers of inflammation also decreased. My take: This study shows that improvement in inflammation is associated with meaningful improvement in anemia. However, most patients will need additional treatment for anemia, particularly as anemia may be related to blood loss in addition to anemia of chronic disease/inflammation. 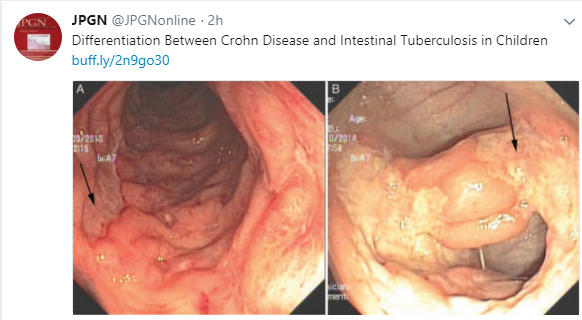 This entry was posted in inflammatory bowel disease, Pediatric Gastroenterology Intestinal Disorder and tagged anemia, anti-TNF therapy, hepcidin by gutsandgrowth. Bookmark the permalink.